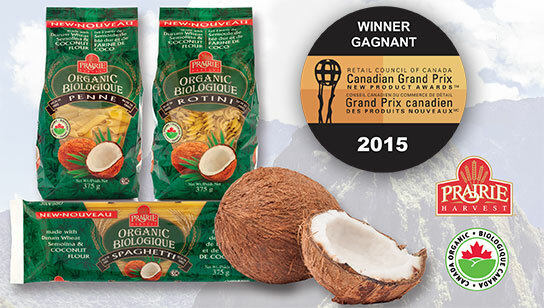 Winner of a prestigious Canadian Grand Prix award! At Prairie Harvest, we decided a long time ago to take our time to craft fine pasta the old-world way. Slow-dried, using only the best ingredients. We also decided that we must make our products affordable so Canadian families can enjoy the benefits of organic goodness at fair, everyday prices. That's why, whether it's our Prairie Harvest Organic Durum Semolina Pasta, our amazing organic beans, barley and popcorn, our Gluten-Free San Zenone corn and rice pastas and our delicious Gluten-Free sauces, or our world-famous Artesian Acres Organic Kamut Pasta made from the ancient grain of the Egyptian Pharaohs, you can depend on us for great taste, variety and great value. All, from a proud Western Canadian company, to you. We want the best of taste, nutrition and health for you, your family, your home. Enjoy nature’s best with the pasta lovers Corn Pasta! Made wheat-free in a gluten-free facility. Cultivated with true amoré on family farms, made wheat-free in a gluten-free facility. A winning combination of four Organic Ancient Grains… Delicious, true, al dente texture.. Produced using only 100% Certified Organic Whole Wheat Durum Semolina. High in fibre and texture. Highly nutritious… award winning ... provides many health benefits beyond its nutritional content..
A line of GLUTEN-FREE Certified Organic Pasta Sauces to surpass all others! These new Certified Organic Prairie Harvest products are a gift from Mother Nature. Prairie Harvest’s regular pasta is European quality… with Canadian value. 100% organic, pesticide free Kamut pasta contains more protein than conventional wheat.